The Secret Recipe Club is a monthly event that pairs food bloggers in secret so that they pick a recipe from their assigned partner, and blog about at the exact same time. My group always posts on the last Monday of the month, but we had a vacation break in December. Having barely survived SRC withdrawal syndrome, here I am to report on the outcome of my virtual stalking of Nicole’s site, Hapa-tite. I was delighted to learn the rationale behind her blog’s name: Hapa is a Hawaiian word that means “half” and is used to describe a person of mixed race with partial roots in the Asian or Pacific Islander heritage. Hawaii is one of our favorite spots on earth for a vacation. We love the atmosphere, the music, the pace of life, the people, and you cannot beat the weather. Weather? Sore subject. As I type this on a Sunday morning, a foot of snow is laying in our backyard. Simply put: a meteorological tragedy. But, rather than dwell on the harsh reality of January in Kansas, I will tell you that two other recipes fought very hard to be featured in the Bewitching today: her Chicken-Lime Skewers with Apricot Glaze, and her Pork Souvlaki. 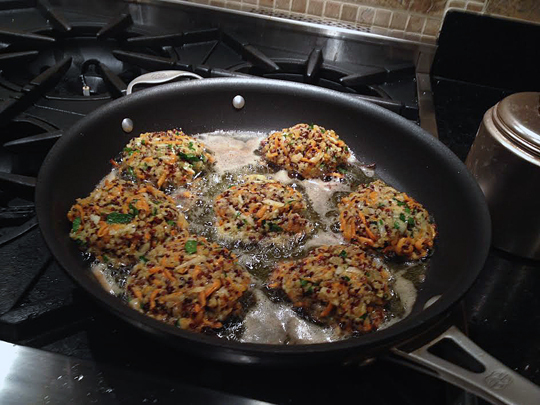 In the end, the chance to use my black, red & white quinoa made me go for these tasty little fritters. Bring 1 cup (250 ml) of water to a boil in a small saucepan over high heat. Add quinoa and 1/4 teaspoon of salt. Stir, reduce heat to medium low, cover with a lid, and cook for 20 minutes until quinoa has absorbed all the water and it’s tender. Set aside to cool. Heat a medium saute pan over medium high heat. Add the olive oil and cook the shallot for 3 minutes. 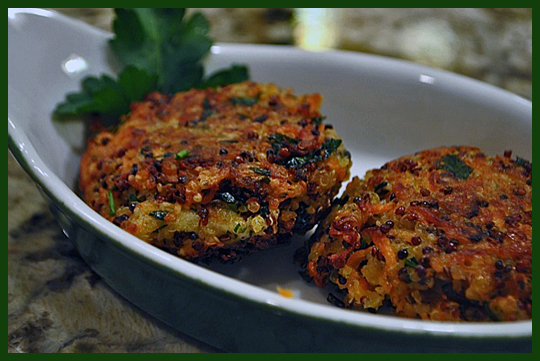 Add the grated sweet potato, 1/4 teaspoon salt, coriander, and black pepper, and cook for another 3 minutes. Set aside to cool slightly. In a bowl, whisk together the eggs, breadcrumbs, cheese, parsley, and chives. Add the cooled quinoa and sweet potato mixture. Stir to combine. Heat a large saute pan over medium high heat. Add enough grape seed oil to cover the bottom of the pan. Spoon 1/4 cup of the mixture and shape it into a round cake. Add enough cakes to the pan without overcrowding it. Cook for 3 minutes on each side or until golden. Finish frying all the cakes. Drain them on paper towels before serving. Comments: Aren’t these cakes the most colorful thing ever? I modified the recipe a little bit, adding more sweet potato than called for, and using a mixture of different quinoa colors instead of only white. They turned out quite festive. Those who have gluten intolerance can use gluten-free bread crumbs, or I suppose almond flour could go well too. You could probably get by with only 1/4 cup of almond flour as a binder. I also think some grated ginger could be fantastic together with the coriander and the herbs. Fun things to try.